Growing from the Missouri River up into British Columbia and Alberta, this variant can be distinguished by it linear leaves as opposed to the whorled leaves found on the type. Title photo courtesy of Wikimedia Commons was taken by Jason Hollinger near the Peace River in Alberta. Photo was cropped from original. This file is licensed under the Creative Commons Attribution 2.0 Generic license. Insert photos #1 - #3 all courtesy of Louis M. Landry and were taken in Albert, Canada. 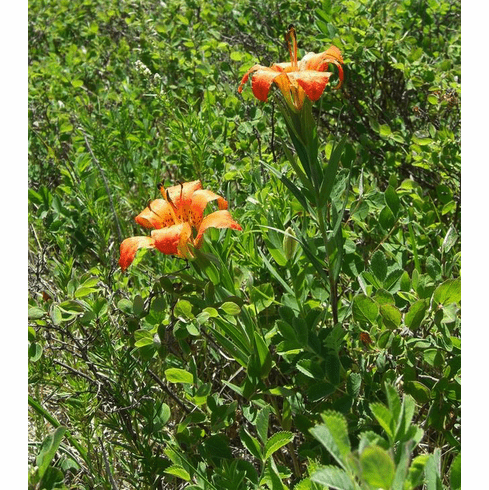 First insert shows natural habitat with various color forms found in this lily. Insert #2 and #3 are of an example of the blue-red colors this species can produce. Copyright Louis M. Landry, all rights reserved. Source CalPhotos. Used with permission.